Fabulously romantic bridal gown with guipure lace detail and bateau neckline. The plunging v at the back of the dress gives a dramatic effect. 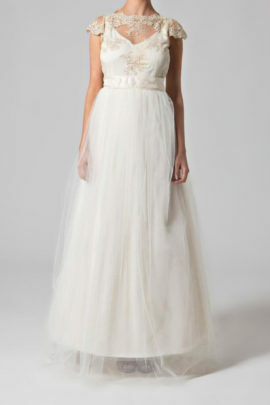 If the thoughts of slipping into a traditional gown scare you, a boho wedding dresses is the perfect choice. Our Blossom dress will suit anyone who simply loves the natural boho aesthetic. 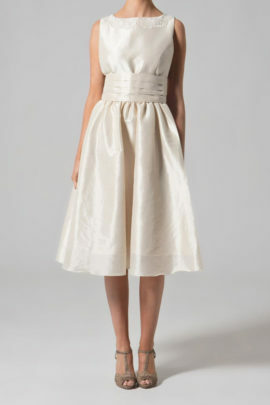 Made out of a beautiful silk crepe this gown feels weightless and is unbelievably comfortable to wear. The high bateau neckline at the front gives way to dramatic plunging V at the back. The small puddle train gives a lovely effect but is easy to manage. A heavy Guipure lace trim completes the look.